Taking care of an aging parent can be exhausting at times, but it’s important to remember there are many benefits to being a family caregiver as well. Whenever you run into roadblocks or become frustrated, you need to keep those benefits in mind. Here’s a quick look at seven advantages of caring for a senior parent. Many people find it difficult to be empathetic toward aging parents when they aren’t in their parents’ lives. To make it worse, some seniors also downplay their medical issues and financial worries, and their families might never realize exactly what they’re going through. When you’re around your parent, you’re likely to be more empathetic because you’ll see those problems firsthand. Keep in mind you don’t have to take on all the caregiving responsibilities yourself. Many seniors prefer aging in place over moving to an assisted living facility. If your senior loved one needs assistance to remain safe and comfortable while living at home, reach out to Home Care Assistance, a leading Huntsville elderly home care agency. Our dedicated in-home caregivers can assist with meal prep, bathing and grooming, exercise, medication reminders, and many other important tasks. Almost every adult child is going to drift away from his or her parents at some point. Over the years, your daily phone calls or weekly visits might turn into annual trips that only last for a few days. Caring for your parent in the senior years gives you the opportunity to rebuild your relationship with each other. Carrying out the same menial tasks every day can weigh heavily on an individual, which is just one of the many reasons some people feel as if they have no purpose in life. As a family caregiver, you can rest assured your daily tasks are going to have a major impact on your loved one, which could drastically change your worldview. Leading by example is one of the best ways to help your parent boost his or her health. You and your loved one can spend a little time exercising every day or even start a diet together. Having someone hold you accountable might be just what you need to boost your own physical health and mental wellbeing. Taking care of yourself is important. Family caregivers need to care for their own wellbeing. If you’re caring for an aging loved one and are feeling overwhelmed, consider hiring a professional caregiver to provide respite care. Huntsville families who want to prevent burnout can turn to Home Care Assistance. One of our professional caregivers can assist your loved one at home while you take a nap, go to work, run errands, or go on vacation. In addition to rebuilding your relationship with your parent, you’ll also be able to bring the rest of the family together. Help your parent plan parties, schedule vacations, or set up weekly family dinners. When one family member steps up, the rest often follow suit. As seniors grow older, catching medical issues early on becomes extremely important. With your parent nearby, you won’t have to worry about him or her ignoring serious symptoms. You can also help your loved one schedule preventative treatments and regular checkups. You’ll most likely need assistance from a professional caregiver at some point, but you might be able to save some money by carrying out a handful of caregiving duties on your own. Even if you have a professional caregiver come over a few times a week, you can still take care of minor chores and errands. Being a caregiver for a loved one can be extremely rewarding, but it may also become overwhelming at times. Seniors can face a variety of age-related challenges. Though some families choose to take on the caregiving duties, there may come a time when they need a trusted Huntsville home care service provider. Families sometimes need respite from their duties so they can focus on their other responsibilities, and some seniors need around-the-clock assistance that their families are not able to provide. 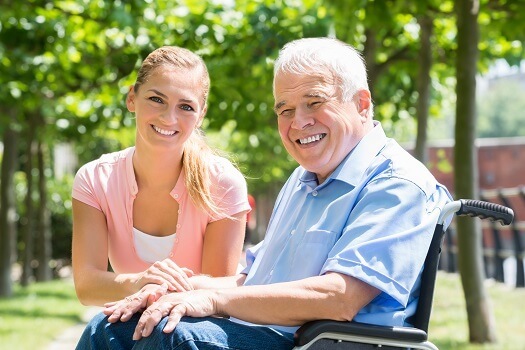 If your loved one needs professional care, Home Care Assistance is here to help. To hire a compassionate, dedicated caregiver, call us at (256) 716-9940 today.